The introduction of two-gene Clearfield technology and the release of an Oklahoma-developed two-gene Clearfield wheat variety have resulted in increased interest in the Clearfield system in the southern Great Plains. This has also resulted in several questions, some of which I will attempt to answer in this blog post. If you have specific questions regarding rates, timings, etc., I encourage you to contact your local BASF representative. Are Clearfield wheat varieties GMO’s? No. The Clearfield system is a non-genetically modified crop herbicide tolerance technology. What is two-gene technology and what does it mean? As the name implies, two gene Clearfield varieties have two copies of the gene that confers resistance to imidazolinone herbicides. Two gene varieties have “Plus” or “+” in the name (e.g. Doublestop CL Plus). In wheat two-gene technology provides the option of adding 1% v/v methylated seed oil (MSO) to the spray solution. In my experience, addition of 1% v/v MSO greatly increases Beyond efficacy on feral rye. Methylated seed oil should NOT be added to the spray solution for one-gene Clearfield varieties, as crop injury will occur. What is the new OSU two-gene Clearfield variety? 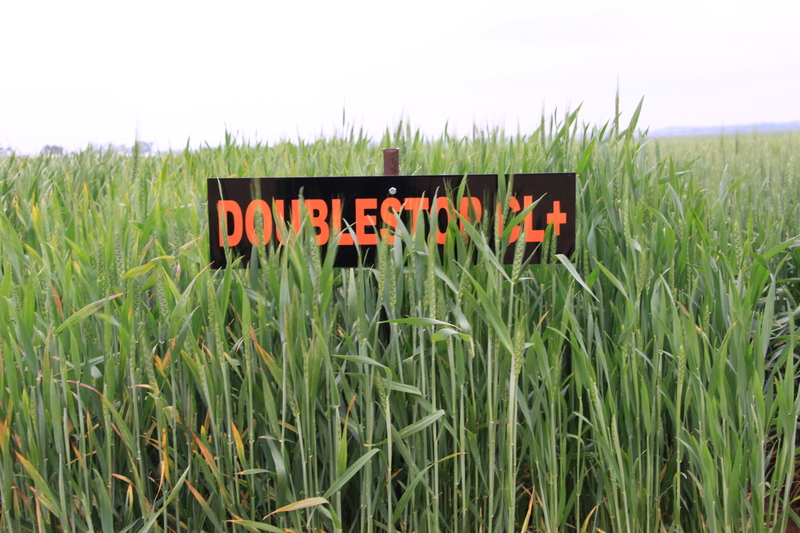 Doublestop CL Plus was released by OSU in 2013 and is marketed through Oklahoma Genetics Inc. It is a late to first hollow stem and late maturity (about the same as Endurance) variety with a wide area of adaptation. A few of the strengths of Doublestop CL Plus include yield potential, acid soil tolerance, test weight, and milling and baking characteristics. More information on Doublestop CL Plus can be found by clicking here. Can I save seed from Clearfield varieties? No. The gene that confers the Clearfield trait is protected by a utility patent and new seed (registered or certified) must be purchased each year. Can I grow a Clearfield variety two years in a row? The better question might be should you grow a Clearfield variety two years in a row? Multiple years of using the same herbicide or herbicide mode of action can result in herbicide resistance. Of particular concern is jointed goatgrass, which has the ability to hybridize with wheat. This ability to hybridize could result in a population of resistant jointed goatgrass in a fairly short time period. So, if jointed goatgrass is the primary weed problem, rotating crops and/or herbicide chemistries to avoid consecutive years of Clearfield technology is a good stewardship practice. Other grasses, such as feral rye, do not have the potential to hybridize, but the potential for weed resistance is still there through selection pressure. In these situations, I would not be as concerned about two consecutive years of a Clearfield system, but would certainly switch herbicide chemistry for a year after that. By osuwheat in Weeds, wheat on May 21, 2014 .